Sam Averill led Bonny Eagle with 14. 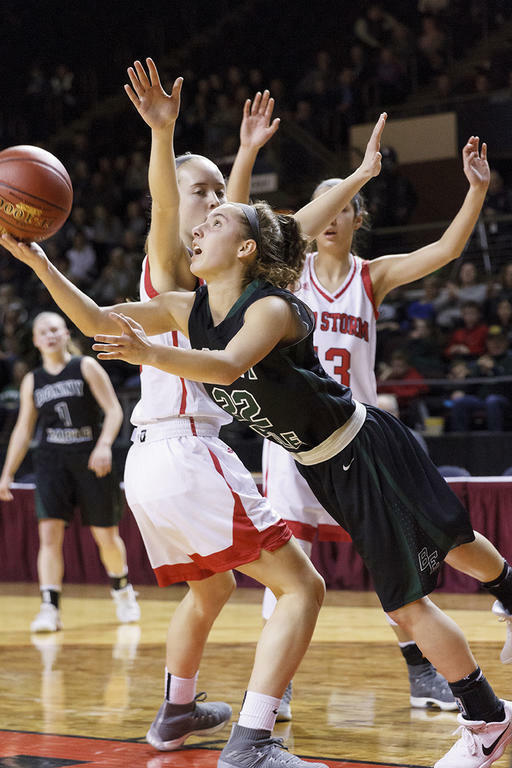 PORTLAND—Sam Averill put up 14 and Mackenzie Emery and Taylor Johnson eight each when the Scots clashed with the Storm on Tuesday morning, Feb. 20. Those totals, though, wouldn’t be enough, as Scarborough built an early lead, then managed to hang on for a 48-40 W.
The Storm jumped on top from the very get-go, outpacing the Scots 12-6 through the first quarter. Bella Dickinson and Julia Freeman knocked down momentum-grabbing frees for Scarborough, while Glidden warmed up her arm with a two. Dickinson and Madison Blanche also kicked in twos. The Scots doubled their output in the second – Johnson hit a pair of threes in that time, and Averill, Deirdre Sanborn and Lindsay Frazier each hit a two – but they still couldn’t keep abreast of the Storm, who heaped up another 16. Finally, in the third, Bonny Eagle managed to better Scarborough – though not by much. Emery hashed six in the stretch, while Averill earned another three, for a team take of nine. The Storm, meanwhile, grabbed seven. 35-27, Scarborough. The sides matched each other through the fourth, putting up 13 each: Averill accrued seven – on a three, a two and two frees – while Johnson, Sanborn and Mia Ferrante bucketed a two per girl. Blanche and Freeman tallied four frees apiece, and Glidden a pair of twos and alone free. But Bonny Eagle needed more than to match the Storm in the downhill minutes; they needed to surpass them – and by several baskets. At the final buzzer, the Scots remained down, and their season came to a close. Glidden finished with 17 for Scarborough, while Freeman had 15. Blanche added eight, Jocelyn Couture and Dickinson five apiece. No. 2 Scarborough, who topped No. 7 Sanford to reach Bonny Eagle, moved on to Friday, Feb. 23’s Regional Final vs. No. 5 Gorham, who upset both fourth-ranked Maine Girls’ Academy and first-ranked South Portland on their way through the bracketing. Beyond Averill’s 14, Emery’s eight and Johnson’s eight, Sanborn contributed four, and Emma Abbott, Ferrante and Frazier two each. “Sam played a great game on both sides of the court,” Regan said of Averill. The Scots, who entered the tournament seeded third in AA South, retire for the year at 14-6. Bonny Eagle defeated No. 6 Thornton in the quarters. It’s been a banner year for the program, which hasn’t turned in 10-plus wins in decades. Regan highlighted one of the team’s specific accomplishments. “Our team took a focus this year on playing solid defense,” he said, “and finished ranking third in the SMAA in team defense.” Also of note: The Scots finished fifth in offense. Luckily for Bonny Eagle, Sanborn and Ferrante are the team’s only seniors; unluckily for the Scots, the two girls have been critical components on the court. Still, one can expect the team to return capable and rejuvenated next winter. Bonny Eagler Taylor Johnson surveys her pass options. Mackenzie Emery tallied eight for the Scots in their loss. Scot Mia Ferrante – Storm swarming her – battles for the bucket.